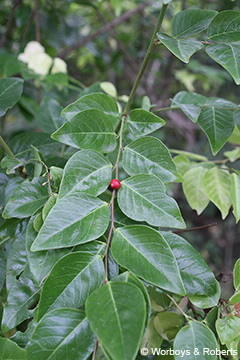 This small tree or shrub has broadly lanceolate leaves usually in the one plane, to 9 x 5 cm. Flowers small, greenish, axillary, fruit red 7-10 mm diam. Leaves produce an offensive smell when crushed. Recent studies indicate that Breynia stipitata is a distinct species but this has not yet been formalized. The photograph is of “B. stipitata”.